We don’t know a great deal about Karbonn Mobile just yet, but they are pushing out some relatively cheap Android kit via Amazon. Their Karbonn A5S is SIM free and available in black or white. It has a 5 megapixel rear camera, 1.2GHz dual-core CPU, 4GB ROM, 512MB RAM and runs Android 4.4 KitKat. To be honest that’s about as much as we know, because the Amazon listing isn’t exactly descriptive. We have managed to find a bit more information elsewhere though, like the fact that it’s got a 4″ screen, 1400 mAh battery and has a microSD card slot for up to 32GB of additional space. Don’t get too excited. It’s a 4″ 800×480 pixel IPS screen and VGA front camera but hey, it’s only £69.99 with free delivery so could be a good stepping stone into the Android smartphone world. 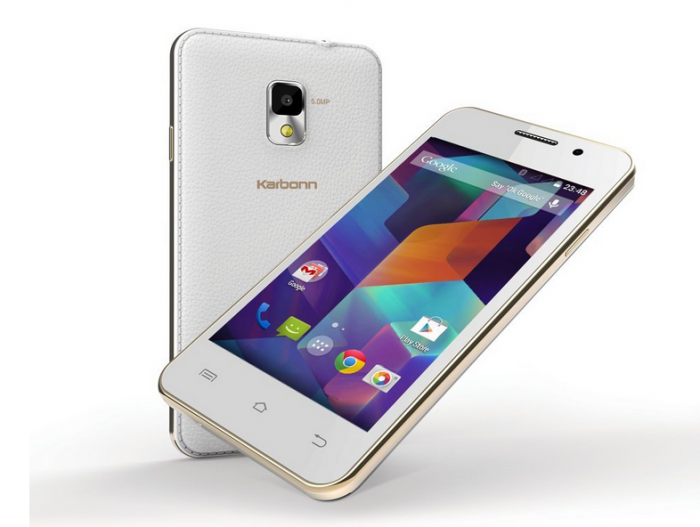 LONDON: Following its successful launch in the UK last month Karbonn Mobile is exceptionally pleased to reveal further details of the brand’s second smartphone to hit the UK. The stylish and feature rich Karbonn Mobile A5S is now available from Amazon.co.uk. This dual SIM smartphone allows the user to have two phone numbers in one handset – ideal for people who like to switch off and party at the weekend, remaining accessible only to a select few. With a standby time of 300hrs and a talk time of well over 12.5hrs this phone would easily outlast the hardest party animal. The A5S is packed with useful technology and operates on Android 4.4 KitKat – meaning the experience is high quality and the user has access to millions of apps from Google Play. The phone’s dual core processor means it’s also fast and reliable to use. The handset has a 4” capacitive touchscreen and the 5MP camera takes crisp and clear photos. Making this an ideal option for people who want a mainstream smartphone – but without the huge price tag or constrains of a monthly contract. The A5S offers something new and attractive without compromising on quality or design. Available now in black or white priced at £69.99 from Amazon.co.uk.